Oaks are well-known for foliage that provides shade from sunlight. However, for birds, oak trees are probably more appreciated for their branches and their acorns – branches for nesting and perching, and acorns for eating. One bird that loves acorns, for eating, is the Eurasian Jay (Garrulus glandarius). These jays are called Geai des chênes in French, meaning “jay of the oaks”. For some youtube footage, showing some Eurasian Jays eating quite energetically, see https://www.youtube.com/watch?v=Kkx2mDE4pGc — “Crazy Jays” by Paul Dinning), one group photo from which youtube video is shown (below). Busy, busy, busy! There is nothing lackadaisical about how these jays hunt for food! A fairly shy but common woodland bird seen in highest numbers in autumn; Jays shuttle between the ‘home wood’ and the district’s oak trees to gather in supplies of acorns for the winter. In longer flights the wingbeats are fluttering and the flight course slow and unsteady. Flying along a woodland edge it glides in gentle undulations. … Breeds in both deciduous and coniferous trees favouring coppice and stands of young spruce or pine trees, has also colonized parks and suburban areas. Feeds on insects, tree fruits, eggs and young of passerines etc. [Quoting Lars Jonsson, BIRDS OF EUROPE WITH NORTH AFRICA AND THE MIDDLE EAST (Princeton University Press, 1993), page 488, emphasis added.] These jays are called Geai des chênes in French, meaning “jay of the oaks”. Acorns are the nuts produced by oak trees. As seeds, they are ready for planting, capable of producing a new generation of oak trees. Like other nuts, acorns are often eaten, by animals (including birds and squirrels) and some humans! Nuts are even mentioned in Scripture as food worthy of cultivation, valuable enough to be used in gift-giving (see Genesis 43:11 & Song of Solomon 6:11). But when I tried to photograph the Eurasian Jay, using the same camera, it hopped sideways, flitting about, so quickly I missed getting a focus – and then it then flew away. Was it camera-shy? Or was it just humans-shy, regardless of any camera? (It didn’t say.) But busy it was, and it appeared to find a few bugs to eat, just before it flew off. Regardless, it was fun while it lasted – watching the colorful Jay hop and hunt for acorns (and bugs), then rest briefly upon a rock, then flit away, to somewhere under the huge, dark, old-growth oak trees (mixed with occasional clusters of birch and evergreen trees) that shaded the lawn, in the garden-like area next to the Finnish restaurant. Suffice it to say: southern Finland is stunningly, refreshingly, relaxingly beautiful, beyond words — and a wonderful, clean, marvelous, splendid, country for birding. The Jay of Eurasia is a permanent resident of virtually all but the northern-most parts of Europe, plus various swaths of Asia (see range map below), so it is no surprise to see one hopping sideways under shady oak trees, in a wooded park, near coastal Porvoo. Pigeon-sized [i.e., about 13 inches long]. Colourful woodland corvid, notoriously shy and wary – generally glimpsed as a coloured bird with black tail and white rump [who] flashes through the trees, screeching its harsh warning. Typical call is a dry, rasping skaak, a familiar woodland sound. Adult: Overall pinkish-brown coloration is relieved by the beautiful shining blue shoulder patch and thick black moustache. All plumages similar. Noisy and excitable; short crest is readily erected, exposing dark streaking. Flight: Action is hesitantly undulating on broad, blunt wings; rising birds initially show black tail contrasting with white rump and wing flashes, and bright blue shoulder patches. Unlikely to be confused [with any other local bird], but compare similar-sized Hoopoe. From below, the black tail contrast with pinkish-brown body. • As well as its angry screeches, wide repertoire of calls includes a buzzard-like mewing note [as well as other calls demonstrating mimicry]. What clever birds God has made these busy woodland-dwelling corvids to be! 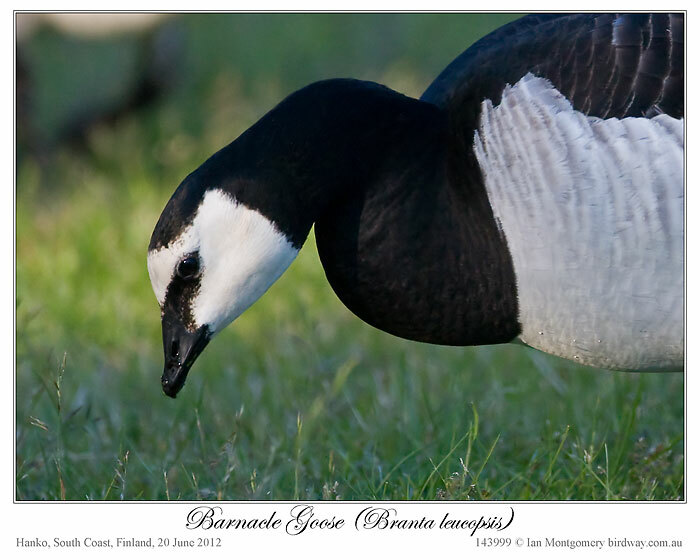 I’m back in Dublin after the sad and sudden death of my brother-in-law Gerald, so I’ve chosen a soberly dressed and elegant bird with, for me, an Irish connection, the Barnacle Goose. 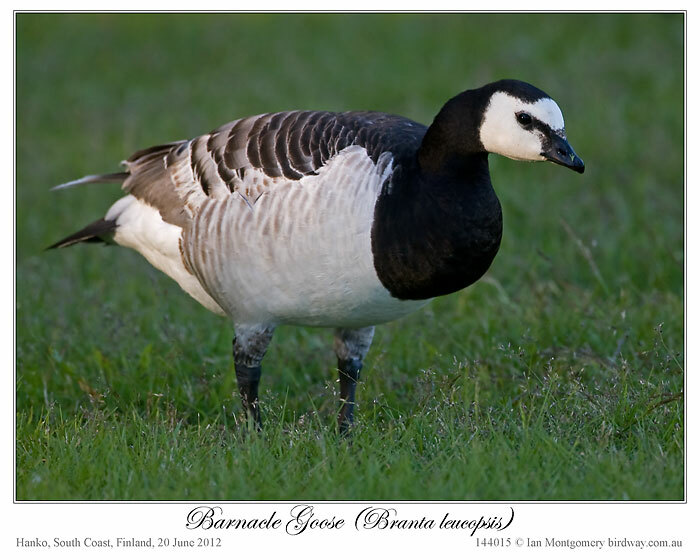 Barnacle Goose nest in the arctic and winter the more remote areas in Western Europe including the West of Ireland. During a particular severe winter in the 1960s I once saw a flock on the Bull Island in Dublin Bay, a place better known for as a winter haunt of the closely related Brent (British Isles) or Brant (North America) Goose. On the last day of my trip to Finland in June, I came across a flock grazing near the beach in Hanko on the south east coast. I assumed that it was a feral flock as they were very approachable and I discovered only later that Barnacle Geese have been nesting on islands in the Baltic for the past 40 years. They are relatively small with a length of 55-70cm/22-28in and, I think, very beautiful. The specific name leucopsis means ‘white-faced’ and the genus Branta comprises the mainly black and white geese including the Brant/Brent and the Canadian. The name ‘Barnacle’ was originally applied to the goose not the crustacean and the two are linked by a strange myth that developed in the middle ages when the nesting sites of the goose were unknown and the nature of bird migration was not understood. To explain the mysterious appearance of these geese, it was proposed that they hatched from the goose-liked stalk barnacles Lepas anserifera (‘goose-bearing’) which grows on drift wood. 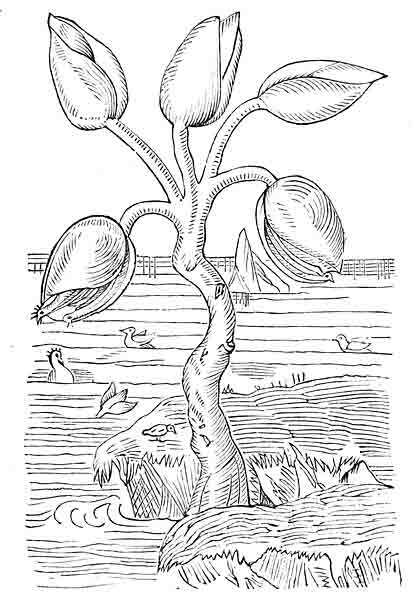 The confusion was confounded by the notion that the goose barnacle was actually a plant and sometimes called the goose tree, below, reproduced from Wikipedia. The myth naturally had religious consequences as it was argued that the Barnacle Geese were not of animal origin or not really fowl. So, eating the goose on meat-less fast days was considered by some Christians to be acceptable. The Jewish faith took a different approach and ruled that they were kosher and must be slaughtered appropriately. Thanks, Ian. Sorry to hear about Gerald. We will keep you and your sister’s family in our prayers. That is an interesting myth. See more of Ian’s Bird of the Week. Ian’s Birdway – Ducks & Allies. The concept of a bucket list (things to do before you ‘kick the bucket’) hadn’t been articulated then, but the Black Woodpecker went straight onto mine. 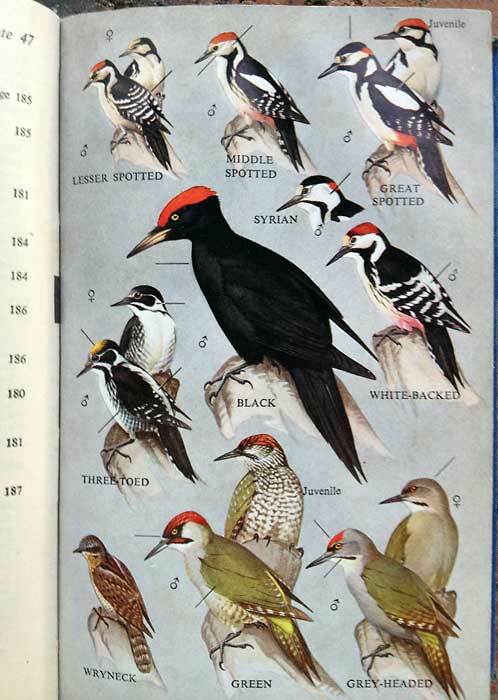 So, when the only route that Qantas could offer me a few months ago for a frequent-flyer ticket in the general direction of Ireland was on Finnair via Helsinki, I immediately thought ‘Black Woodpecker’ (and ‘owls’, another great page in the field guide). 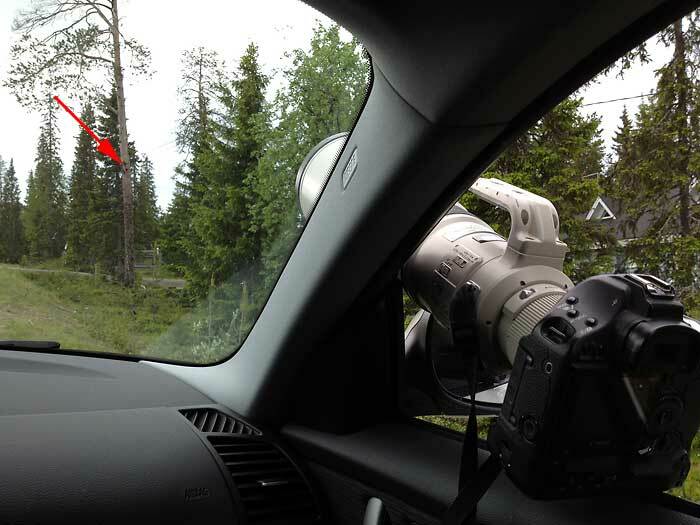 In fact finding birds such as woodpeckers and owls in the endless forests of Finland proved very difficult, so eventually I went out with an excellent Finnature guide, Antti (Finnish for Andrew) and a delightful English birding couple in the Kuusamo region. It was a very bad year for owls (owl years are very dependent on cycles in the vole population) but Antti did eventually find us a distant Pygmy Owl and, last bird of all, showed us the nesting site of a pair of Black Woodpeckers. We were treated to a view of the male – the female lacks the red crown, having on a small red patch on the back of the head – arriving to feed the young, but there then followed a long period without any activity and, as it was time to return to the hotel for breakfast, I returned later on my own so that I could photograph them at my leisure. Again, the male arrived (second photo) and three hungry chicks appeared at the nest entrance. The male then fed them, presumably by regurgitation – third photo – as he didn’t appear to be carrying any food when he arrived. At 45-50cm/18-20in in length, these are crow-sized birds are the largest Eurasian Woodpecker and comparable in size to the related Pileated Woodpecker of North America. Their white bill is 5cm/2in in length and an impressive implement. They usually dig a new nest hollow each year, but Antti told us that this pair had used the same one for two years running. 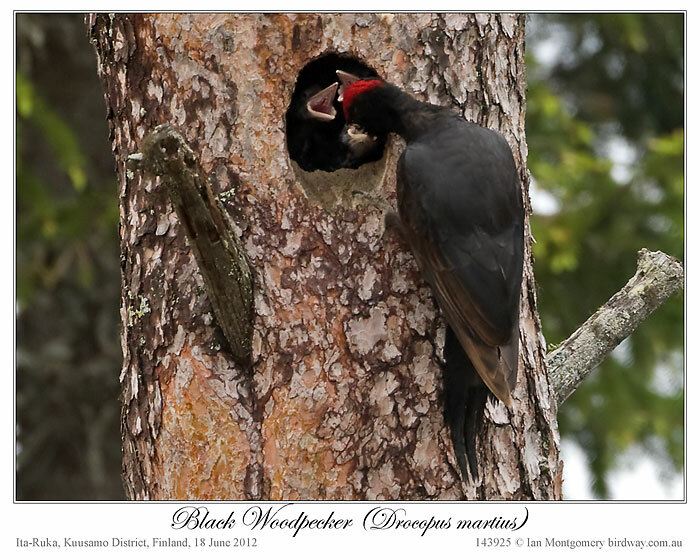 The Black Woodpecker is quite widespread in mature forest in Eurasia and is expanding its range. After feeding the young, the male left the nest for several minutes and then returned and entered the hollow. Nothing further happened for over half an hour until the female, who had been in the nest all along, emerged and flew off (fourth photo). The nest was in a tree on a quiet road outside a house, so I was able to watch it in comfort from my rental car (fifth photo), the red arrow indicating the location of the nest. 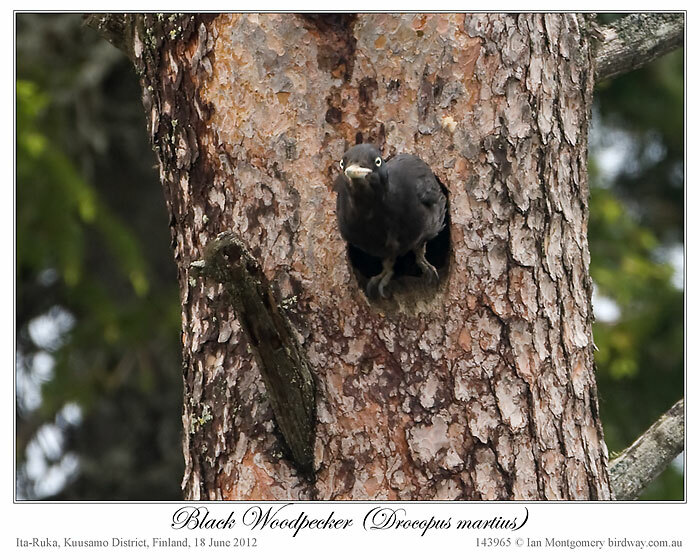 So, my visit to Finland reached a satisfactory conclusion and the Black Woodpecker lived up to expectations. Three days later I flew to Dublin, where I am now to join the rest of the family and await the arrival of the first member of the next generation. My niece went into hospital yesterday and the arrival of the baby, ten days overdue, is anticipated either tonight or tomorrow. Congratulations on a new generation beginning. Also obtaining another of your bucket list birds. What a neat bird. That camera lens is something else! Thanks again, Ian, for sharing your birdwatching photography with us. We await your next adventure in to the domain of the birds. The Woodpeckers are in the Picidae – Woodpeckers Family of the Piciformes Order. Check out Ian’s many Woodpecker photos. 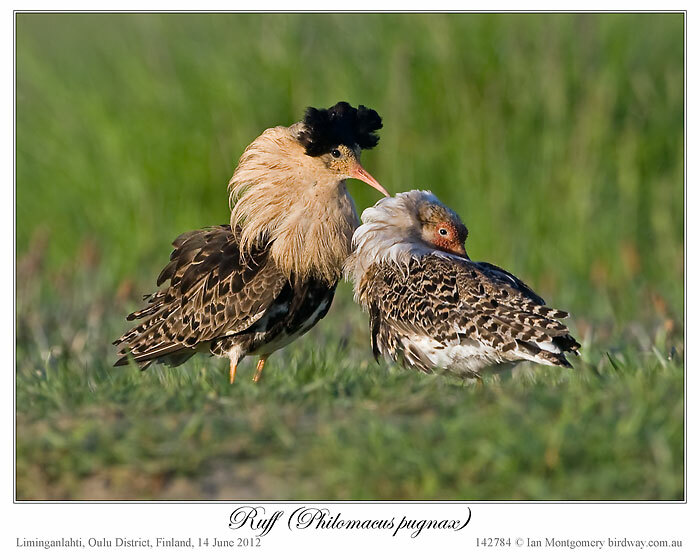 This week we have nothing short of a fashion parade, male Ruffs at a communal display ground or lek in eastern Finland. 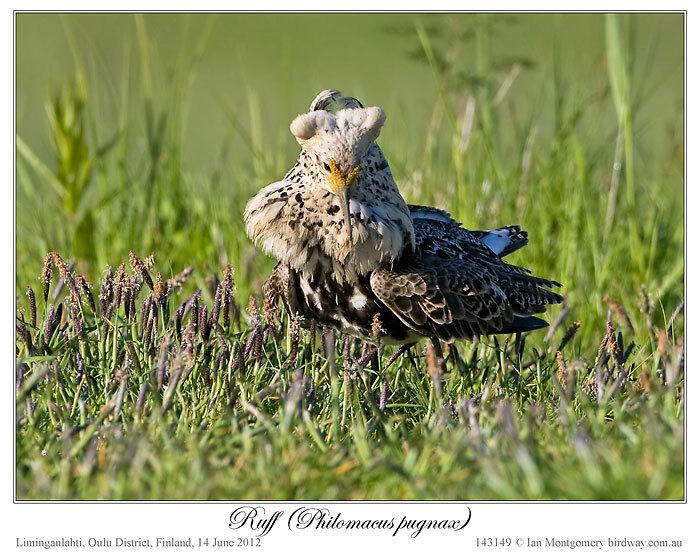 Finland is my second stop-over on the way to Ireland to visit my family and I am spending a week in the northern part of the country in search of some unusual northern European birds. I spent a couple of nights in Oulo on the west coast, a 1 hour flight north of Helsinki and then drove north west to Kuusamo near the Russian border where I am now. In Oulu, the birding and wildlife tour company Finnature put me very early in the morning in a hide that they had set up near the lek. I settled down to watch a rather unpromising-looking piece of raised ground in a meadow, having been assured that, though it was late in the season, a couple of birds had been seen at the lek on the previous morning. After about half an hour and shortly before 4:00am the black-ruffed bird in the second photo arrived but flew off when I moved the camera. Happily, it soon returned and this time the second white-ruffed bird arrived too and the pair started their extraordinary display, spreading their ruffs and wings apparently to make themselves appear as intimidating as possible. Sometimes, they jumped vertically in the air and at other times they crouched low on the ground in submissive looking postures. Although the birds often came into close physical contact, there was no actual fighting and no physical damage. These black- and white-ruffed birds were the main performers during the 4 hours that I remained in the hide, but other birds joined in and at one stage there were about 10 birds on the lek. The colours of the ruffs and the erectile feathers on the head were varied. Here is a buff and black one with the white bird. The colour of the bare wattled skin on the face varied too, being sometimes yellow and sometimes red, though it was my impression that this colour wan’t permanent and the red flush was associated with more intense display. 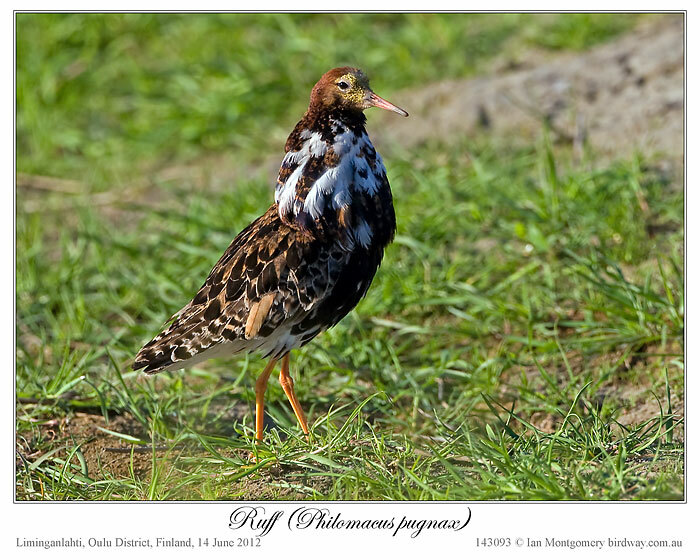 This non-displaying one with a chestnut cap, piebald ruff has yellow facial skin. This one is mainly chestnut. While this one with an ermine ruff look suitably regal. 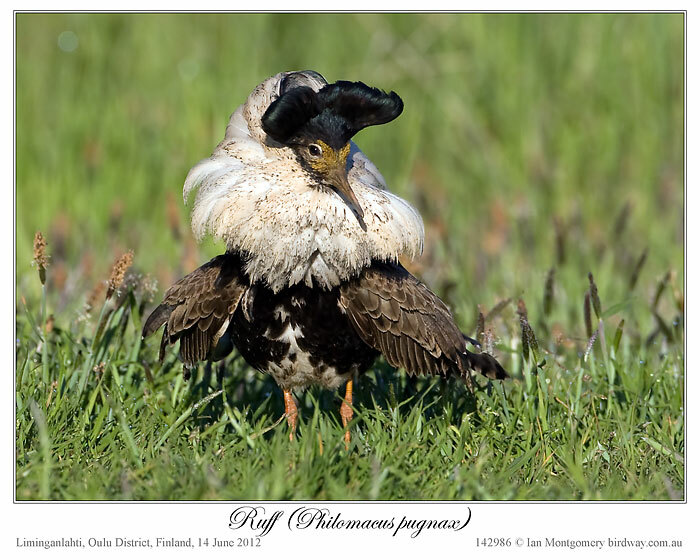 Ruffs are unusual among lekking birds in that the display is aimed mainly at other males to establish dominance, rather than at attracting females. Females may mate with multiple males producing young with different fathers and homosexual mating also occurs. 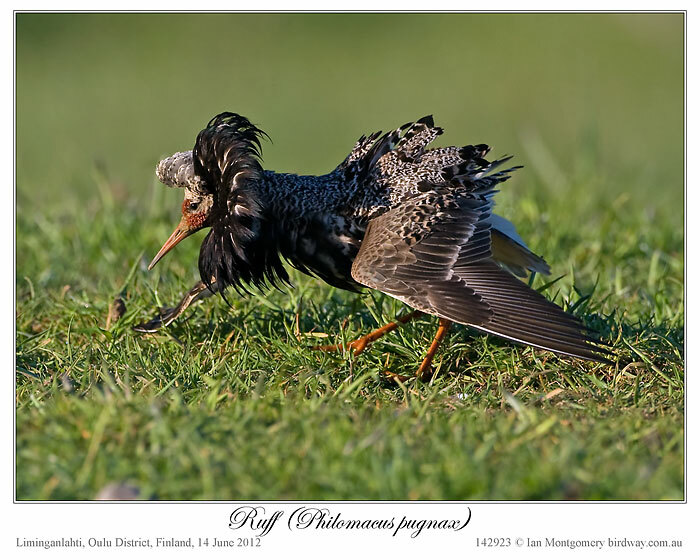 The different ruff colours are apparently significant and white-ruffed males are smaller and less dominant and called satellite males. The females, called Reeves, are quite plain and look rather like other sandpipers such as Sharp-tailed and Pectoral. In non-breeding plumage, the males resemble the females but are larger and longer-necked. 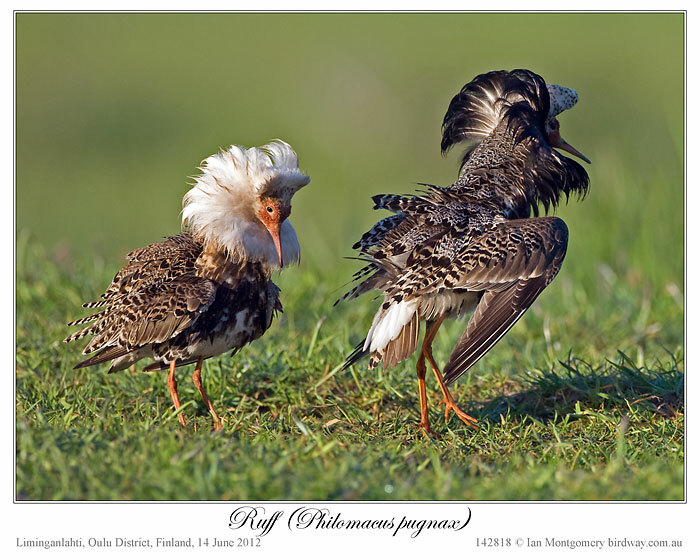 Ruffs breed across northern Eurasia from Scandinavia to Siberia and winter in Africa, Asia and, in small numbers, Australia. You can see a female and ruff-less male, photographed in India, here: http://www.birdway.com.au/scolopacidae/ruff/index.htm. Who said waders are plain and boring? I had a wonderful time at this lek. 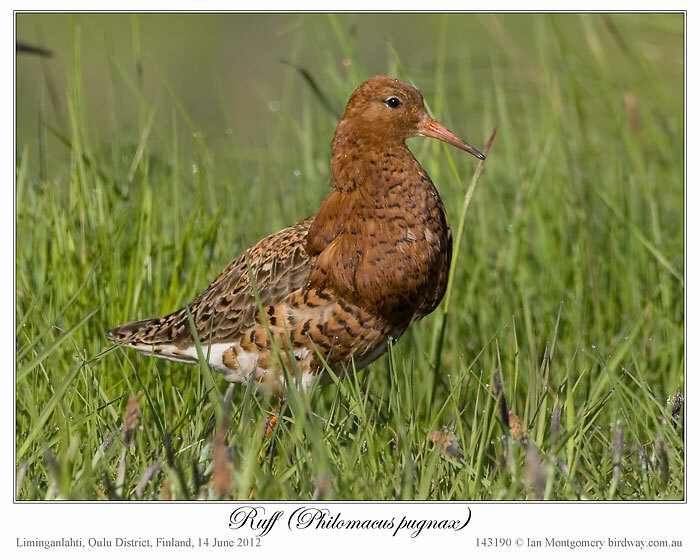 The Ruffs wasn’t one of my target species in Finland but an unexpected bonus, thank you Finnature. 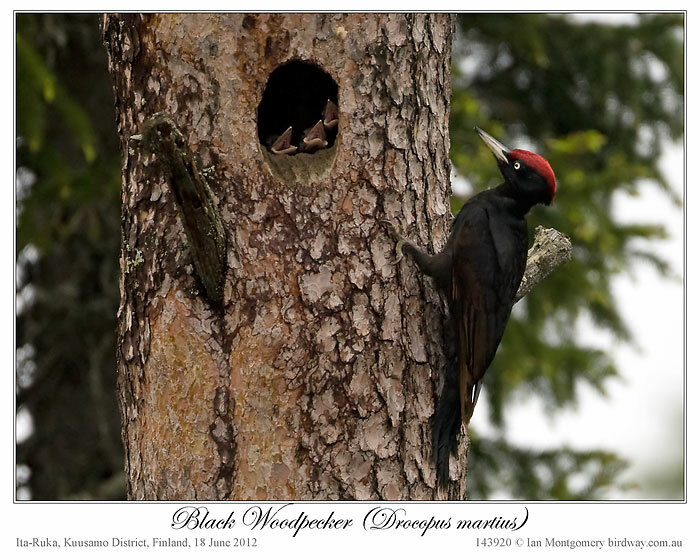 My main target was the largest Woodpecker in Europe, the Black Woodpecker, but that’s another story. What a group of “show offs.” I find these birds amazing. Never thought of this family as having leks like the pheasants and those in that order. Just goes to show you that the birds are doing what they are suppose to and that is reproducing. What a show for the females to get to watch. 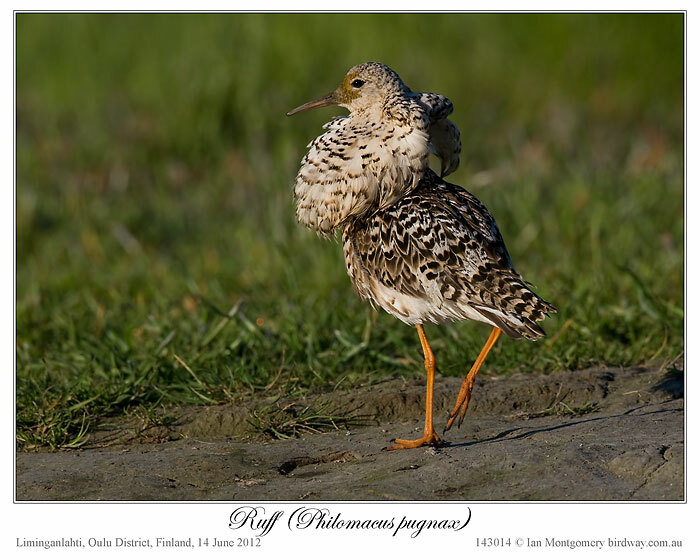 The Ruff is in the Scolopacidae – Sandpipers, Snipes Family in the Charadriiformes Order.